Remember last summer when we told you about Holland America Line offering an exceptional 3-day girls’ getaway cruise with Oprah Winfrey and her best friend, Gayle King, as exclusive guests? Well it happened last week… We know, time flies! And what’s even crazier is the incredible donations Holland America Line received during the celebratory cruise to the Bahamas. They reached an overall donation of $6 Millions! Yes! The cruise line has gathered $6 million in support of Cancer through its On Deck for a Cause programme, since its launch in 2006. Throughout the entire fleet, on every sailing, the cruise line invites all passengers to participate in a non-competitive 5Km fundraising walk. For 13 years, all donations have been distributed among the American Cancer Society, Canadian Cancer Society, Cancer Council Australia, Cancer Research UK and Dutch Cancer Society. On Deck for a Cause events are usually held on sea days. Participants are encouraged to donate $20 to the cruise line foundation and join the 5Km walk around the ship’s decks. Guests are welcome to walk only a portion of the 5Km, or given the option to not walk, should they not feel fit enough. They receive an On Deck for a Cause T-Shirt, a wristband and an invite to a reception after the walk as a “thank you” for being a great support to the foundation. This year, in the wake of the $6 million milestone, the after-walk reception turns into special celebrations. Traditional lemonade, sparkling wine, cake, appetizers and other treats will be part of the festivities. What a win-win situation! You get some steps in while being part of an honourable cause and you are rewarded for it! What if this year you changed the way you cruise? Embark on one of Holland America Line’s ships in 2019 and help fight cancer and support research. 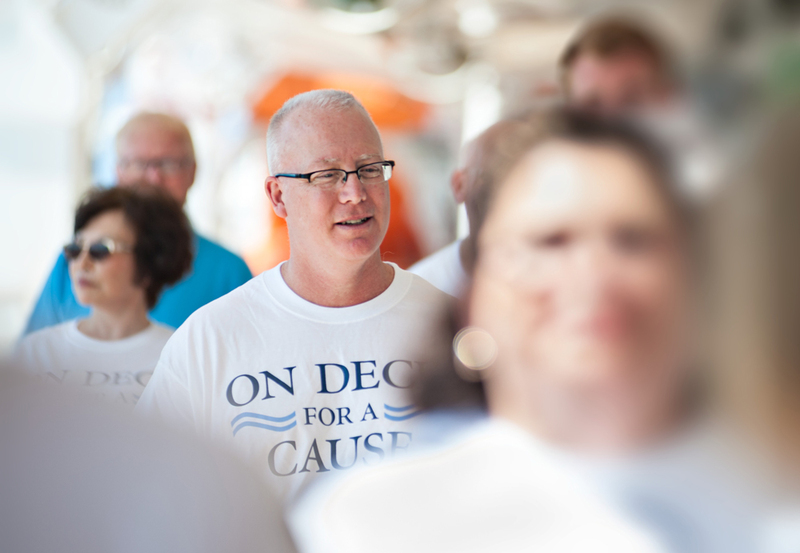 This year, over 500 On Deck for a Cause events will be held. Whether you would like to discover the beauty of the Mediterranean, the Caribbean, the South Pacific or South America, you will be able to contribute to a great cause. Do not hesitate to contact our Cruise Specialists to find out more information about the On Deck for a Cause program and reserve your next cruise!